The moat around the ancient and iconic Tower of London have been turned into a sea of red ceramic poppies. The extraordinary artwork from artist Paul Cummins is a remarkable tribute to the fallen of World War I. They have been planted by volunteers, 120,000 of them so far and the planting will continue until the last one is placed on Armistice Day on 11 November 2014. In total 888,246, one for each of the British and Commonwealth soldiers who died, will have been placed creating what is already and what will be even more, a staggering piece of public art. I went there today, on the anniversary of the declaration of the Great War to see for myself this remarkable tribute to the fallen. It’s a powerful piece and utterly remarkable in it’s scale, here we have public art par excellence. It got me thinking about the anniversary and the sacrifices that people made and how we all owe so much to those brave souls who went to fight in perilous conditions in circumstances that we can only imagine. My own family was touched by the war, my great great uncle William Blomfield, a Yorkshireman who fought for a Scottish regiment, the Seaforth Highlanders. Today his memorial can be found in Greengates, a suburb of Leeds where he lived whilst his his grave is in France, in Doullens where he died of wounds in one of the last major German advances of the war. I’d grown up with tales of Uncle William . At my parents home in Yorkshire, there is a framed tribute of the silk ribbon his mother had made after his death. He died on the 25th March 1918, leaving his mother, sisters and sweetheart behind. It was a poinant reminder growing up of the bravery he had shown and the realisation that his life was over really before it had begun. He was 24. Doullens was the site of the Doullens Conference held on 26 March 1918 the intention of which was to better co-ordinate the British and French military operations on the Western Front. The day before the conference William had died, the victim of one of the last great pushes of the war from the German army. There is a cemetery there now, the Doullens Communal Cemetery Extension No. 1. Operation Michael as the German advance was known began on 21 March 1918 and was the first stage in what became known as Kaiserschlach, the Kaisers Battle or, in English, the Spring Offensive. The plan was to throw everything at the Allies in an attempt to break through the Allied lines, seizing the allied ports. The Germans attacked on many fronts with the battleground of Operation Michael taking place on the ground fought over so viciously two years before at the Battle of the Somme. In the end the Germans managed to advance 40 miles but with a catastrophic loss of life. William Blomfield was one of around 236,000 British troops who were lost between the launch of the offensive on 21 March 1918 and 29 April 1918. In the same time period the Germans lost 348,000 yet the attack was not decisive. Despite making initial gains, the ground proved difficult to hold and supply, torn up from previous battles the surrounding infrastructure had already been destroyed and so moving troops around was difficult. William Blomfield, a drummer, operated during the period as a stretcher bearer, carrying injured soldiers from the front to be treated away from the fighting so far as that was possible. The battle around that time must have been terrifying, from the launch of the offensive to the day he died the bombardment had been relentless. Back and forth he must have trekked taking injured comrades from the front, going back into the breach time and again to retrieve the fallen, eventually falling himself. His battalion, the 1/4th Ross Highland division of the Seaforth Highlanders landed at Le Havre on 7 November 1914 and went straight to the Western Front. They transferred several times into different brigades before eventually joining the 154th Brigade in the 51st Highland Division on 7 January 1916. They were on the front in Cambrai when the Spring offensive began, fighting in the battles of St. Quentin and the battle of Bapaume, the first two phases of Operation Michael. Attacked on both sides and ‘drenched in gas‘ they fought a retreat back towards Arras and Doullens as the Germans advanced losing 4900 men. It was at some point during the retreat in those four days since the offensive began that William was injured and taken towards the Canadian Stationery Hospital at Doullens where, on 25 March 1918, he eventually died of his wounds. Attacks from the Royal Flying Corps and rearguard actions from the cavalry of the third army had slowed the German advance possibly long enough to for William to be transferred but it wasn’t enough. The day afterwards at the Doullens Conference, the allies took a more co-ordinated approach in order to try and hold back the advance, combining both operations of the French and British armies under the leadership of General Ferdinand Foch, a Frenchman. The attacks continued but the more unified command structure gave confidence in the ‘steadfastness of the Franco-British alliance’ and provided the grounding for the staying of the German advance. Researching the history of the great uncle who I never knew I was struck by how many others will have an ancester with a similar past. William Blomfield was a working man from a Northern town. It is unlikely that he would have ever travelled more than a few miles outside of his home village prior to the war, let alone to the fields of France, it must have been terrifying and exciting at the same time. Now the tribute at the Tower commemorates not only Private William Blomfield but all those who died with him. It should provide a reminder, especially poignant, of the huge sacrifices that people made. Only a blink of an eye ago really when you think about the fullness of time and realise that the Great War, which devastated so much, wasn’t really that long ago. Monday 4 August 2014 represented the 100th anniversary of the declaration of the First World War. 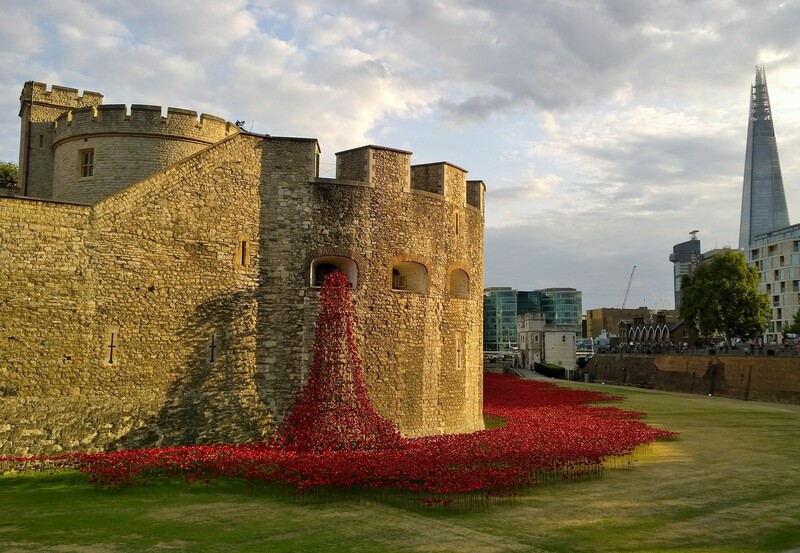 The artwork at the tower will continue to be planted up until Armistice day on 11 November 2014 eventually containing 888,246 ceramic poppies. Private William Blomfield was born in Appleby, Yorkshire and lived in Greengates. He is remembered on the cenotaph in the town and is buried in Doullens. He died on 25 March 1918. THIS IS A WONDERFUL AND BEAUTIFUL TRIBUTE TO THE FALLEN BRAVE. UNFORTUNATELY, WE CONTINUE TO LOSE BRAVE SOULS BECAUSE OF RADICALS AND TERRORISTS AROUND THE WORLD IN OUR FIGHT FOR DEMOCRACY AND FREEDOM. Thank you so much for writing this tribute to our Uncle William.